Lords have come forth to wage war in the Heavens and on the Earth. 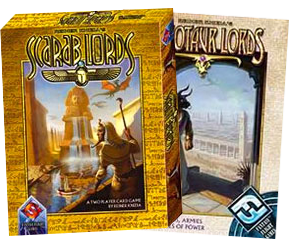 The excellent Scarab Lords and its successor Minotaur Lords seem to have been forgotten with the success of Blue Moon, Reiner Knizia’s later non-collectible card game, but this earlier system by the prolific game designer is still great fun. This rules summary covers both games and fixes a big error in the Minotaur Lords rules.